BirdLife International, with Société d’Ornithologie de Polynésie (SOP Manu – BirdLife Partner in French Polynesia) and Island Conservation, has just completed an ambitious conservation operation on six remote islands in the Tuamotu (Acteon group) & Gambier archipelagos. The project makes an unprecedented contribution to saving one of our world’s rarest birds and a number of other endangered species from extinction. With the support of local people, government and NGO organisations – many helping directly in project implementation – this operation has reset the native ecological balance to a time probably not known on these islands since Polynesian colonisation. Local livelihoods are also expected to benefit as a result of the project’s success. The Critically Endangered Polynesian Ground-dove Alopecoenas erythropterus, locally known as the Tutururu, is one of the world’s rarest birds. Found on just five small atolls in French Polynesia, there are only about 150 of these birds left in the world. Thanks to this project the safe habitat now available to the Tutururu has more than doubled. Even though these islands are in the middle of the Pacific Ocean over 1500km from Tahiti, their isolation has not protected them from a negative human legacy. The birds on these islands evolved in the absence of predatory mammals, but the arrival of humans also brought a suite of invasive species. Flightless and defenseless, chicks and eggs are eaten by invasive predators such as rats, and native ecosystems are severely disturbed by other animal and plant invaders. The team’s surveys in this project confirmed that almost all of the remaining Polynesian Ground-dove live on a nearby rat-free atoll. Using island restoration methods proven on over 400 islands around the world, the team created much-needed safe habitat for the resident and Critically Endangered Polynesian Ground-dove, Endangered Tuamotu Sandpiper Prosobonia parvirostris (Titi) and Endangered Polynesian Storm-petrel Nesofregetta fuliginosa, as well as a number of Critically Endangered plant species. “Rarely do we get the chance to have such a big impact in biodiversity conservation with just one project”, said Steve Cranwell, Operation Manager and Invasive Species expert from BirdLife Pacific. “In the last few days of the operation more Polynesian Ground-dove and Tuamotu Sandpiper were sighted on Vahanga – the chances of finding established populations on these islands in a year’s time are high”, said Richard Griffiths, Island Conservation Project Director. “This is a sign of hope for recovery not only for these French Polynesian species, but for the hundreds of threatened island species around the world waiting for similar interventions on their behalf”. Delivering this incredibly important result for native wildlife required a herculean logistical commitment and a team of 31 personnel hailing from three continents and six countries. The successful shipment of hundreds of tonnes of equipment, and donated supplies from key partners Bell Laboratories and Tomcat, to these remote islands (including a helicopter); and the ability to overcome adverse weather, intestinal maladies and sleep deprivation, was some testimony to the three years of planning and preparation! “Amazingly, given everything that could have gone wrong, we kept on track”, said Steve Cranwell. A project of this nature is synonymous with adventure. “Flying in a helicopter hundreds of miles over open ocean with nowhere to land other than the distant ‘pin-prick’ atoll you’re aiming for tends to heighten an interest in weather conditions…” recalls Steve. A central part of the operation’s success has been the contribution from local people and organisations. Businesses provided essential services and the French Polynesian government assisted with costs. Local people helped plan the operation and supported its implementation, from surveying for Tutururu and Titi, to helping remove the invasive species including clearing dense tangles of the plant, Lantana, which was out-competing the native forest. The operation is just the beginning of this relationship. In the coming years, SOP Manu and project partners will continue to support the local communities in preventing the return of rats and other invasive species; and in monitoring the return of Tutururu, Titi, and the many other rare seabirds and plants expected to recover with the removal of rats. “Managing coconut production so both the needs of the Pa’umotu people, the native wildlife and ecosystems are met will be one essential element in the ongoing protection of these islands”, said Tom Ghestemme. “It will be one year before we can declare the six islands rat-free, but initial signs are very positive”, said Steve. Effort to save two of the world’s rarest birds may be nearing completion! But our work isn’t done yet; Join us today to be part of the next phase of this exciting project! BirdLife International is the world’s largest nature conservation Partnership. Together we are 120 BirdLife Partners worldwide – one per country – and growing, with almost 11 million supporters, 7000 local conservation groups and 7400 staff. The BirdLife Partnership has successfully restored over 30 islands in the Pacific as part of BirdLife’s global Invasive Alien Species programme, working with our Partners in Australia (Birdlife Australia); the Cook Islands (Te Ipukarea Society); Fiji (NatureFiji-MareqetiViti); French Polynesia (Société d’Ornithologie de Polynésie); New Caledonia (Société Calédonienne d’Ornithologie); New Zealand (the Royal Forest & Bird Society) and; Palau (the Palau Conservation Society). Bird populations are now increasing on these islands, and people are benefiting through livelihood improvements. Société d’Ornithologie de Polynésie (SOP Manu) biodiversity of French Polynesia, and work with the local people to promote the sustainable management of natural resources in a huge Territory as large as Europe with some places not easy to access or costly to reach. 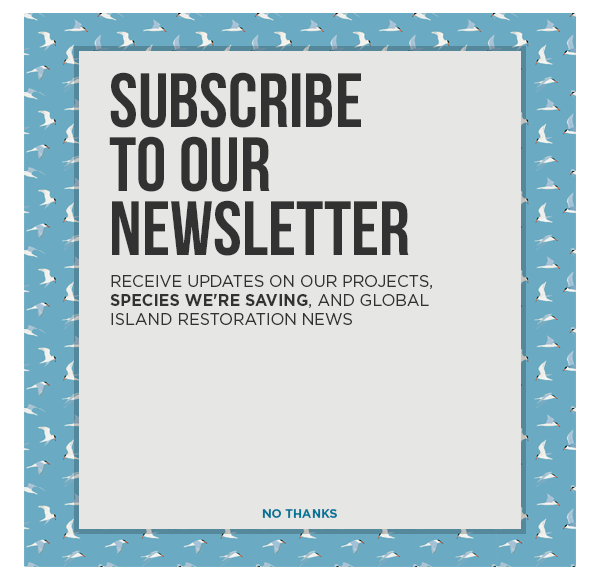 Technical assistance has also been provided by the Pacific Invasives Initiative and the New Zealand Department of Conservation Island Eradication Advisory Group. This project has received support from many international and national organisations with significant funding from the European Union, the David and Lucile Packard Foundation and the British Birdwatching Fair; sponsorships from Bell Laboratories and Tomcat; and assistance from the Government of French Polynesia; The Mohamed bin Zayed Species Conservation Fund; the Pacific Development and Conservation Trust; T-Gear Trust Canada and many individual people around the world.